COLT – Frye Electronics, Inc.
Frye Electronics is pleased to announce the release of the revolutionary COLT Audiometer. 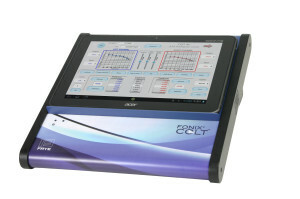 The COLT is a new breed of clinical audiometer, controlled completely by the touch screen interface of an Android Tablet. The user interface is intuitive and elegant, allowing the operator to move between pure-tone and speech testing with a simple touch. The tablet computer interface sits on top of the COLT’s advanced hardware platform that does the hard work of accurate signal generation. This platform is an electronic work of art, containing an advanced collection of both digital and analog circuits. Flexibility and power are combined in one sleek package.